Severe weather season is about to kick off in Colorado, we generally begin to see an uptick in severe weather events by mid to late April in and around Castle Rock. This uptick continues through May and peaks in the first week or two of June, followed by a steady drop-off into July and August. This week is Severe Weather Awareness week as designated by The National Weather Service office for Denver/Boulder. 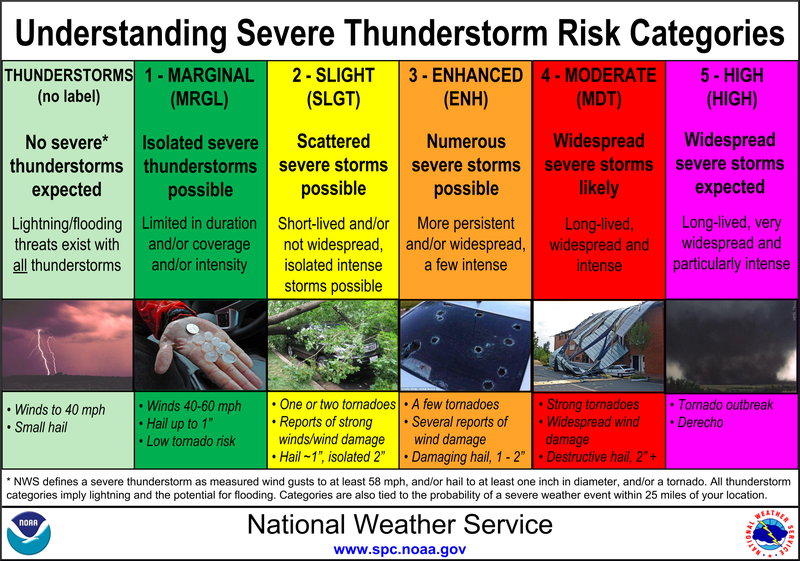 When the National Weather Service sees a risk for severe weather in certain areas they will issue a risk category for those designated areas. It’s important to know what these are as they can designate the possibility and type of severe storm coverage for an area. The most common risk categories we see in the Palmer Divide region are Marginal and Slight, but enhanced risks do show up from time to time. Being in the risk area does not mean all areas will see severe weather, severe storms can be very isolated so not everyone gets hit. The risk area simply means that any storms that form in the risk area have a chance of becoming severe, so it’s worth keeping an eye out if you end up in the risk area. A severe weather outlook may be issued between 1-3 days in advance of a severe weather threat. Usually they are designated by one of the severe weather categories listed above. 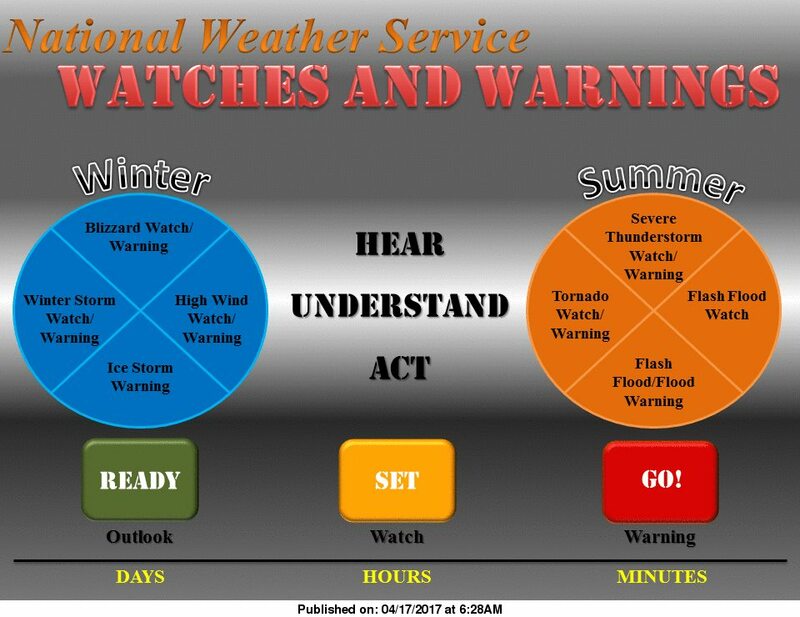 Outlooks give the general public advanced warning of the potential for severe weather in the area and instruct them to be prepared for severe weather. A severe weather watch is usually issued on the day of a severe weather event and means that conditions in the watch area are favorable for some sort of severe weather development. It doesn’t mean everyone in the watch area will see the severe weather, but means that anyone in the watch area could see severe storms. A severe weather warning means dangerous conditions are imminent or occurring. These are usually issued minutes in advance of an impact for severe weather to affect an area. When you hear a warning, this means take appropriate action immediately! 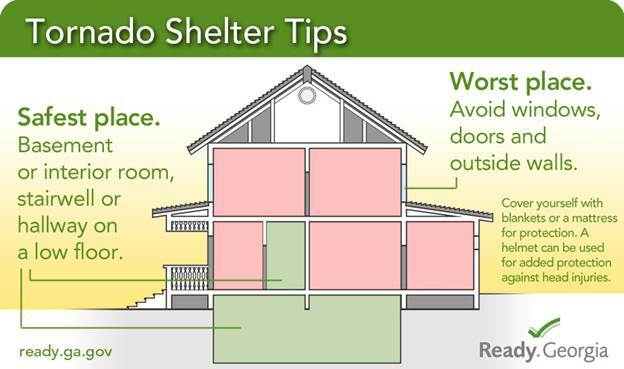 Do you know where to go in case of a Tornado Warning in and around Castle Rock? 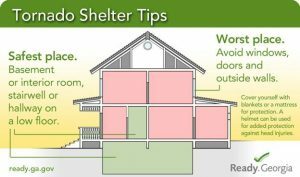 Most houses in our area have basements, seek shelter in the lowest part of the house away from windows and things that may become flying debris. If you can bring blankets or pillows to cover yourself with, that is extremely helpful. Believe it or not, the NWS recommends you put on a bike or ski helmet if one is readily available, this will help protect your head from flying debris. If you are in house with no basement, find the interior most room in the house. Often bathrooms inside the house can be a good place if they are away from exterior walls and windows. Stay tuned for more severe weather information!